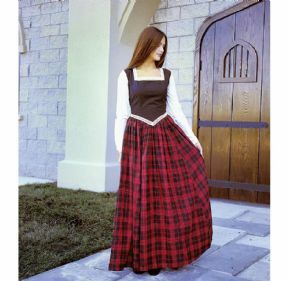 Our Highland lassie dress is designed so the sleeves, bodice and skirt are made into one - eliminating the need for three garments. By doing this you save money and will be a lot cooler with less weight to wear. Dress features a full skirt matching the plaids in our men's kilt. Available only in red/green plaid. The black bodice has back lacing with white lace trim adding to the lovely look of this dress as well as giving a full 4" size adjustment to achieve that perfect fit.